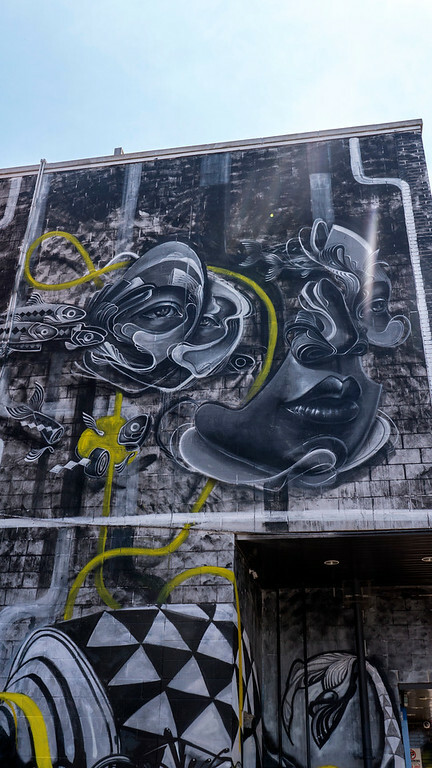 Love street art? You’re in the right place. 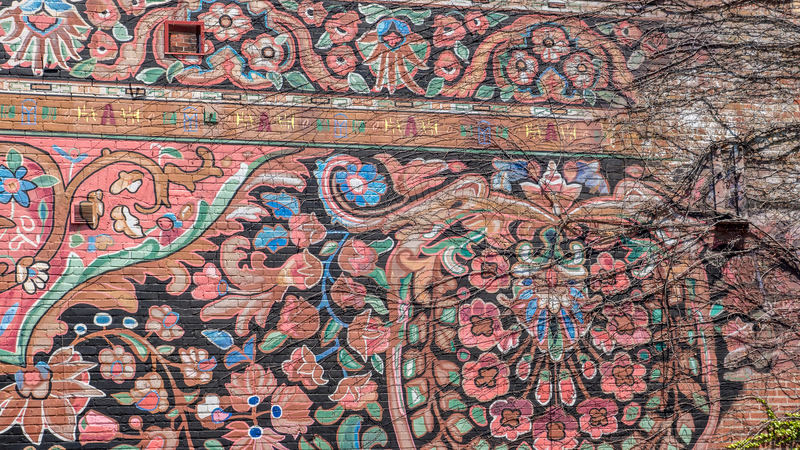 In Toronto, we’re a bit spoiled for street art. 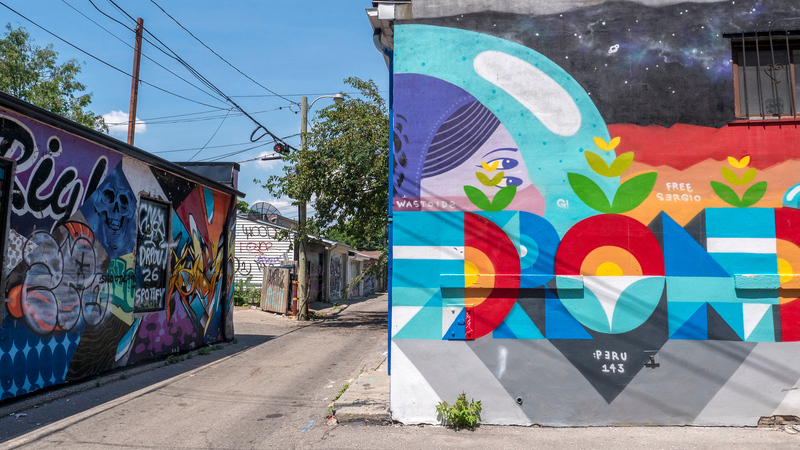 Ever since the introduction of the StreetARToronto program in 2012, the city has more stunning murals than ever before. 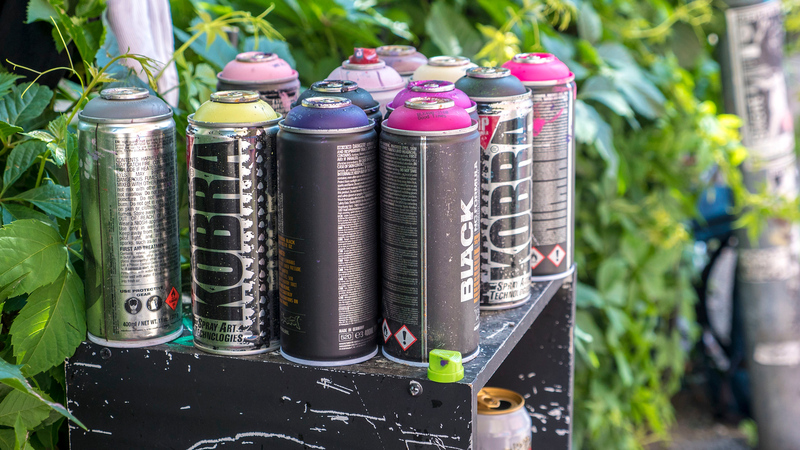 Of course, there was tons of graffiti art and colourful tags before the program, although Toronto is tackling the topic of outdoor art much better than before. Instead of encouraging vandalism by leaving bare walls, there are commissioned pieces featuring bright, vibrant, and engaging works of art. It adds character to the city, too. 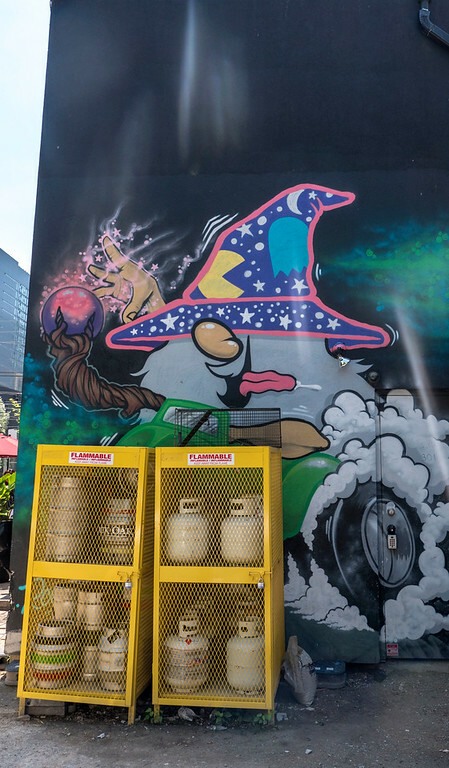 Toronto street art is always in flux; it’s expanding, changing, and there’s a never ending supply of new art to consume. 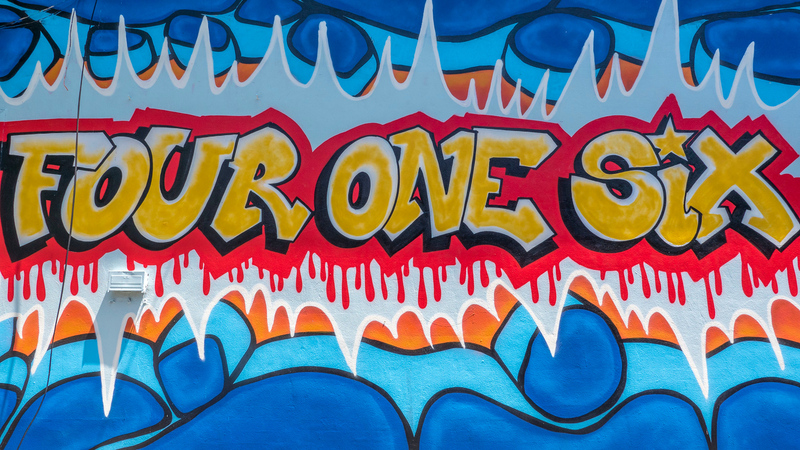 For instance, I was introduced to Graffiti Alley, the most famous spot for street art in the city a few years ago. 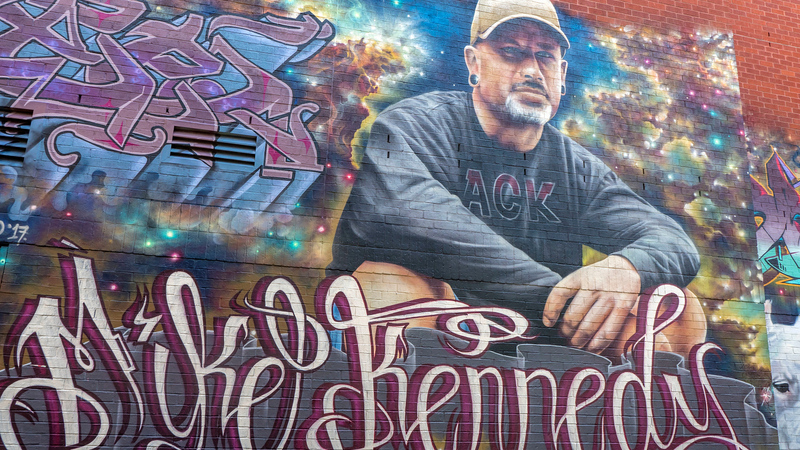 I’ve revisited Graffiti Alley on numerous occasions, and the art changes from year to year. You can visit these places over and over again with an entirely new experience each time. That’s the beauty of this blog post, too. 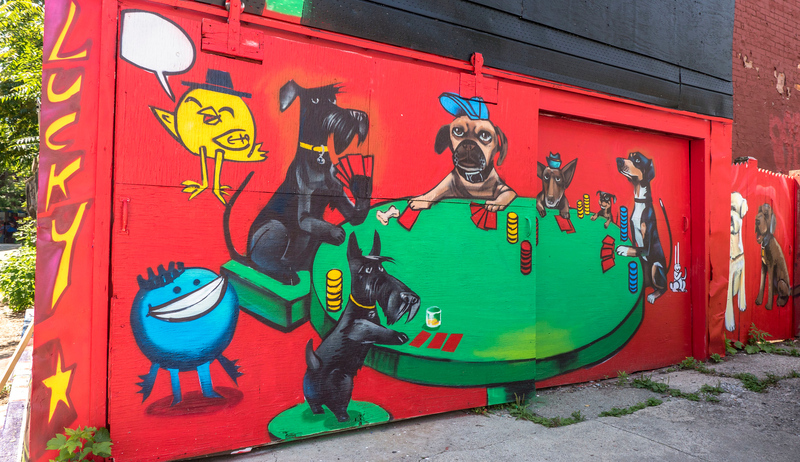 You’ll likely see a bunch of this Toronto street art when you go there yourself. However, this article won’t be a total spoiler. 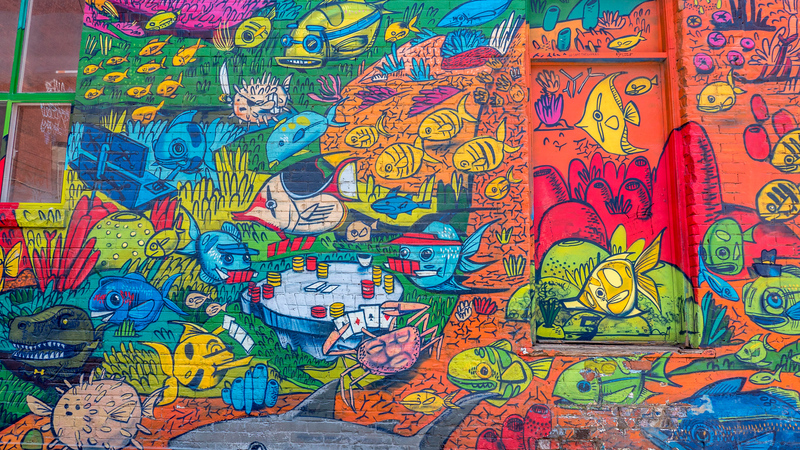 I’m sure that you’ll discover new murals and graffiti on your adventures. 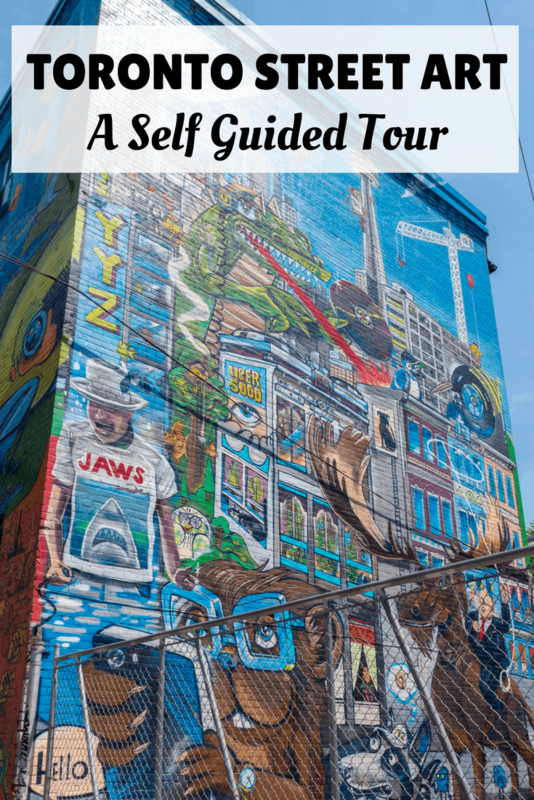 Here is my comprehensive guide to Toronto street art for a self guided walking tour. You can easily explore all of these intersections, side streets, and alleyways all on your own. 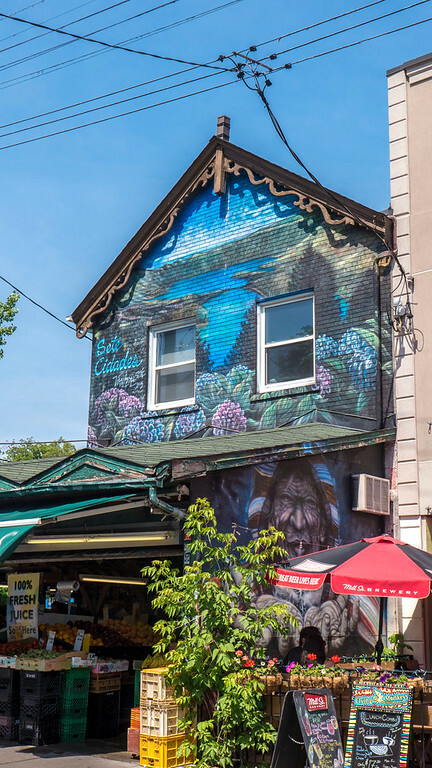 I’ll continue to update this guide as I check out more spots upon wandering around Toronto’s distinct and interesting neighbourhoods. Liberty Village might be the land of the condos, but it’s a thriving and youthful neighbourhood in Toronto. 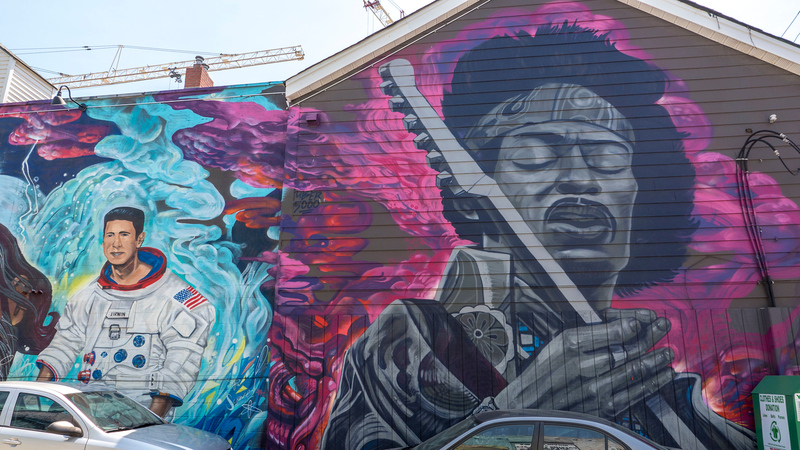 I found a few intriguing murals while I was there. 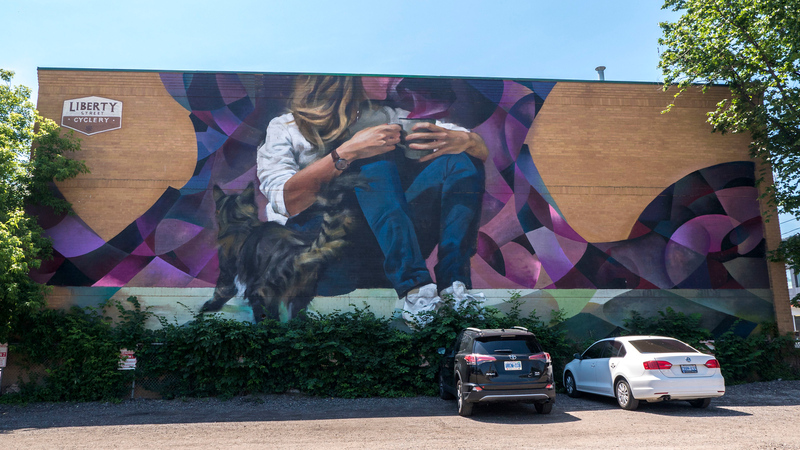 This one is on the side of a building facing the parking lot on 25 Atlantic Ave. It’s got a cat and coffee on it…two of my favourite things! 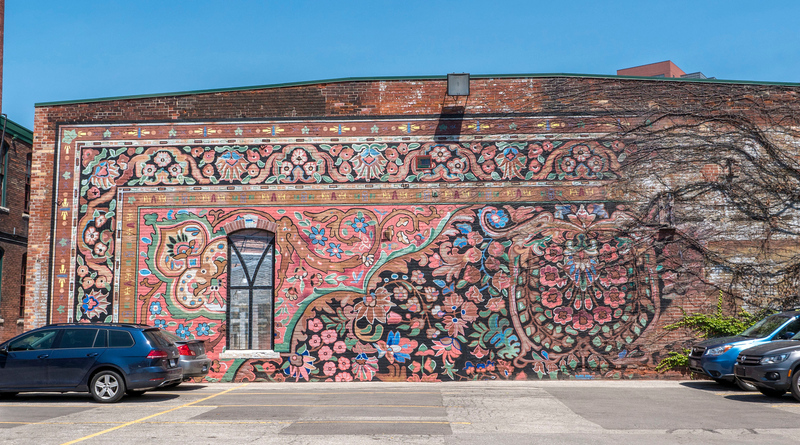 There’s a beautiful one that takes up one entire wall of the old Toronto Carpet Factory building at 67 Mowat Ave. This one resembles a woven carpet with intricate floral patterns in pink, gold, orange, and green. Vines have started to climb across this one, adding mystique to the design. The entire building is an old factory building, restored and repurposed, which makes it an interesting space to wander around. 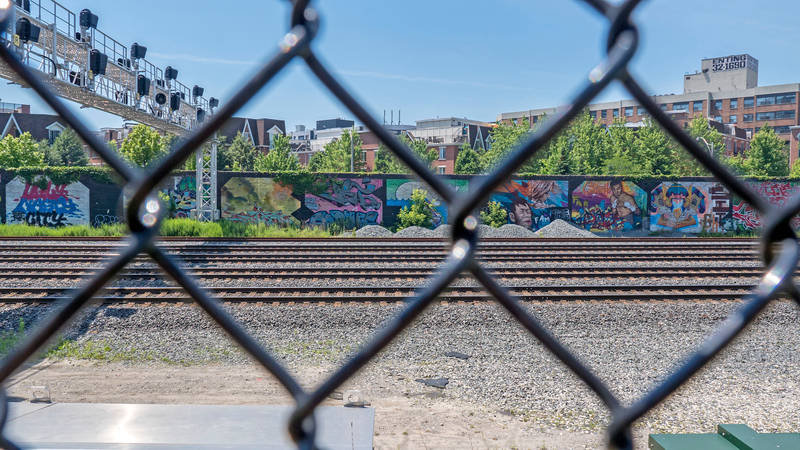 The Reclamation Wall straddles Liberty Village and West Queen West. 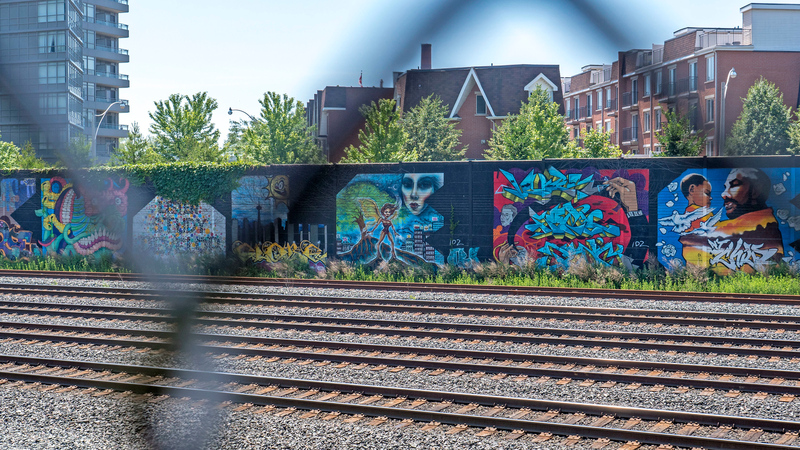 Though it’s on the other side of the railway tracks, you can discover the Reclamation Wall by walking on Sudbury Street, just south of Queen Street West and Gladstone Ave. Spanning over 1000 feet in length, it’s the longest mural in Canada. 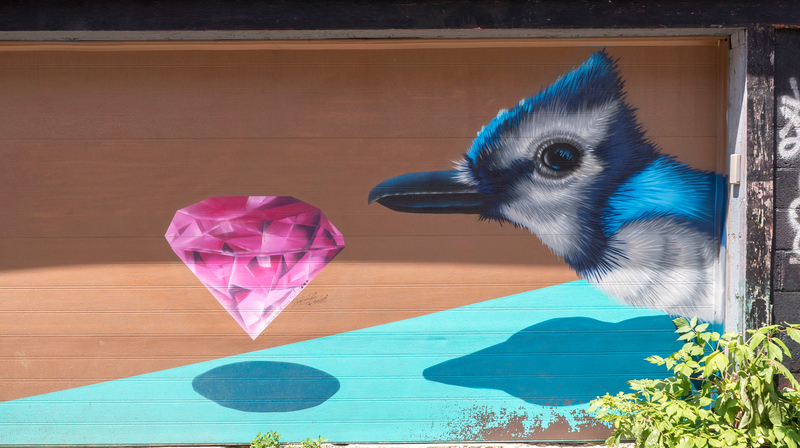 This unique piece of Toronto street art was painted by over 50 artists. 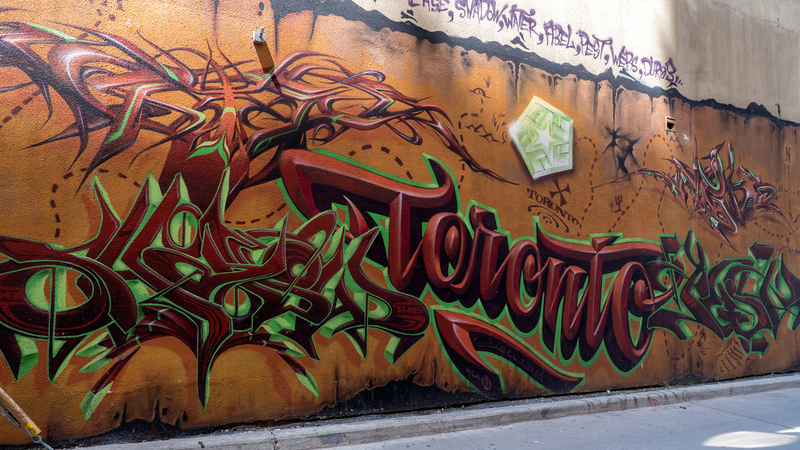 The mural has giant, two and a half story letters spelling “TORONTO”, “LIBERTY VILLAGE”, “PARKDALE”, and “WEST QUEEN WEST”. 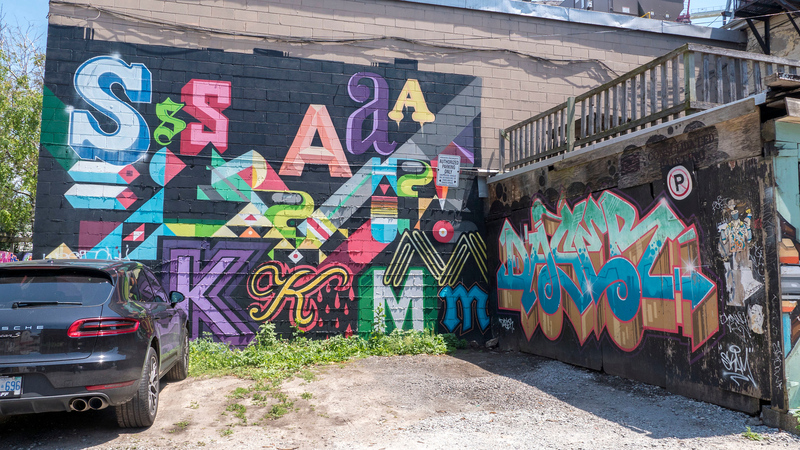 Each letter was assigned to a different artist to paint in their unique style. Though I wasn’t able to get right up close to this one, it’s viewable from Sudbury Street through the wire fencing. 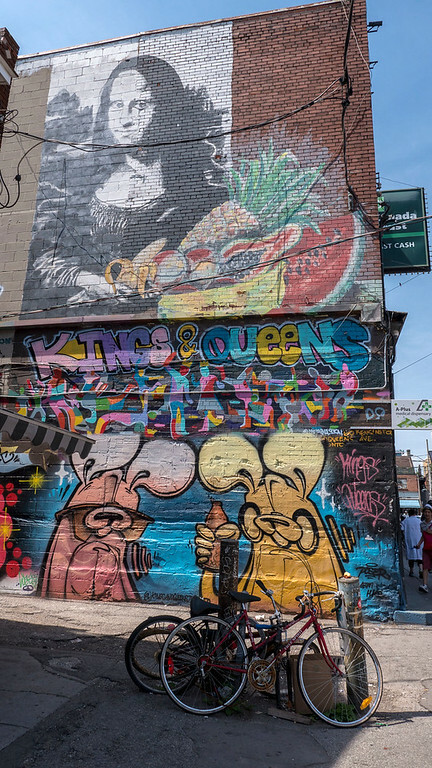 The West Queen West neighbourhood has a high concentration of Toronto street art and murals. 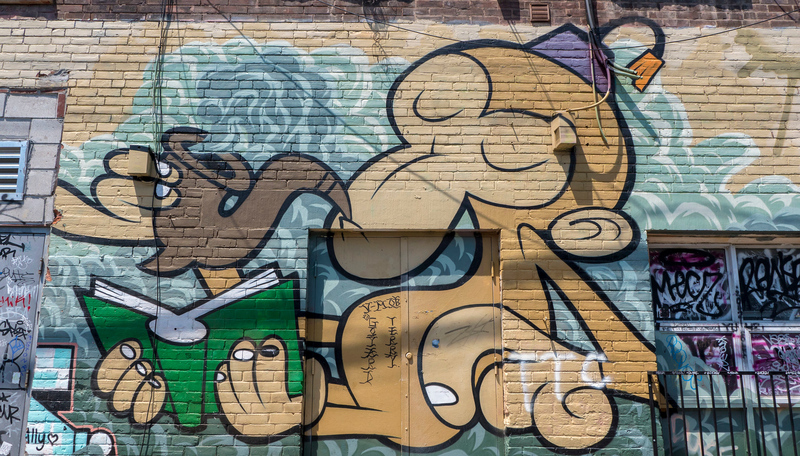 If you walk down Queen Street West between Gladstone Avenue and Spadina Ave., you’ll see lots of graffiti art right on Queen Street and on the side streets. You could easily spend all day here wandering the entire neighbourhood and surrounding area. I’ll highlight a view of my favourites and a couple of spots that deserve some extra attention. 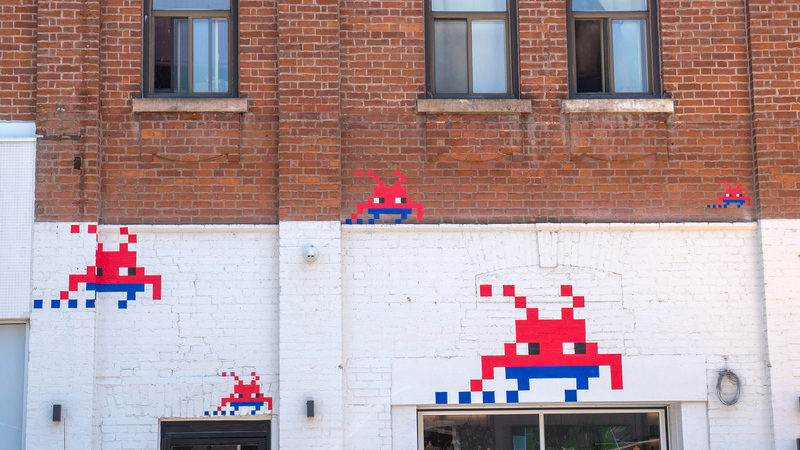 These little pixel, Space Invaders-esque characters are on a building on Northcote Avenue at Queen Street W. I’m a sucker for anything that looks like a retro video game. 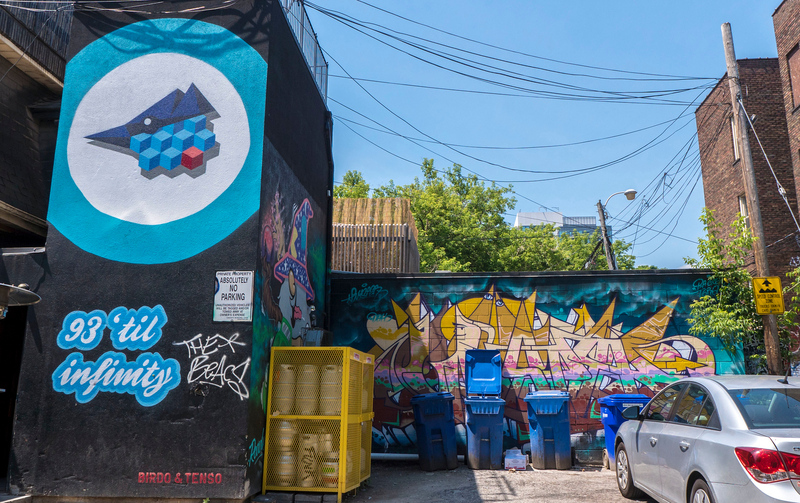 You can find the Toronto Blue Jays wall, along with few other colourful tags and art, on Beaconsfield Avenue directly across from The Drake Hotel. 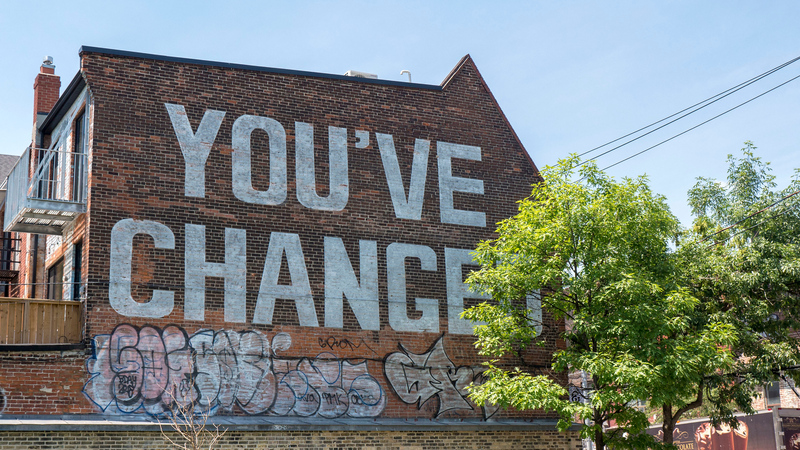 “You’ve changed” is on Queen Street West facing Paul Garfinkel Parkette (between Dovercourt and White Squirrel Way). 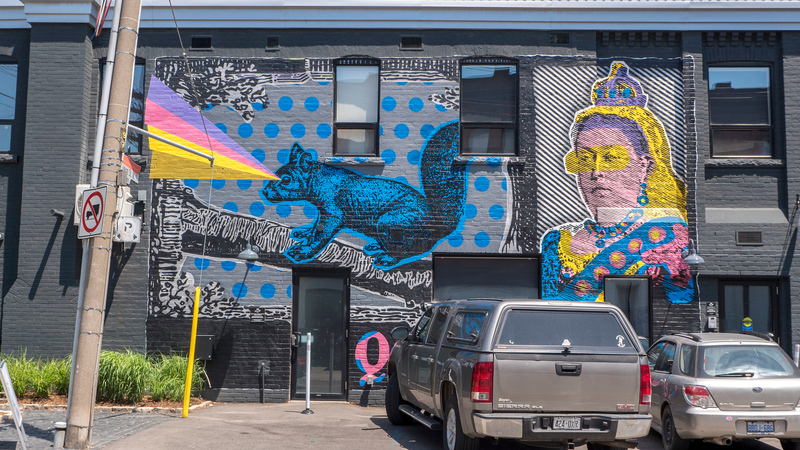 This mural on Strachan and Queen Street West appears to pay homage to the Queen and quite possibly the famous white squirrel who lived at Trinity Bellwoods Park, directly in the direction of where his colourful laser vision is pointed. This pastel, zigzag painting covered in sunglasses was always one of my favourites. You can spot it walking down Queen Street West on Bellwoods Avenue. 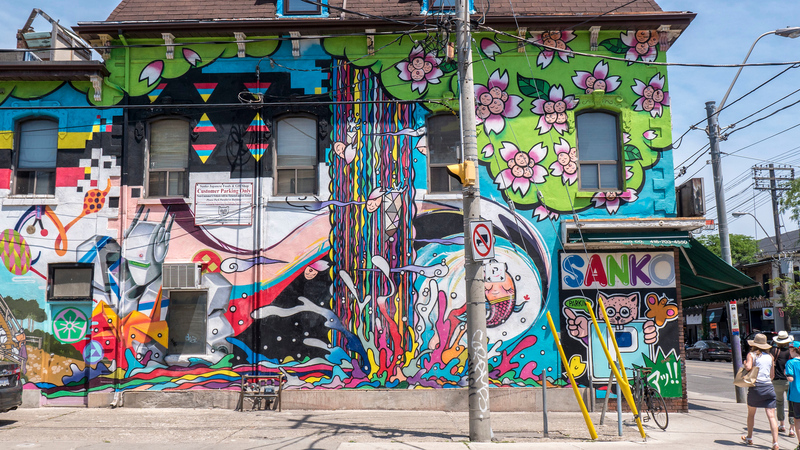 This vivid, Japanese and anime inspired mural is on the side of the Sanko Trading Co building on Queen St W and Claremont St. You can find Japanese candy, groceries, and housewares in the shop, so it only makes sense that the mural reflects aspects of Japanese culture. 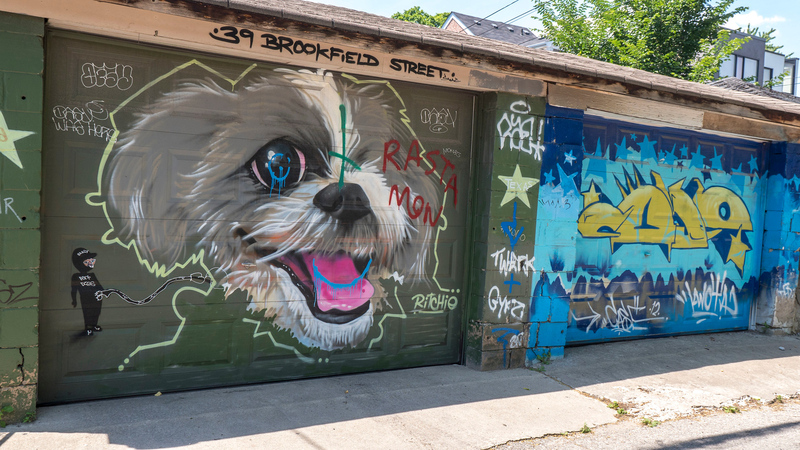 If you walk down Brookfield Street just off Queen Street West, and walk east down some alleyways, you’ll see a ton of spectacular street art. 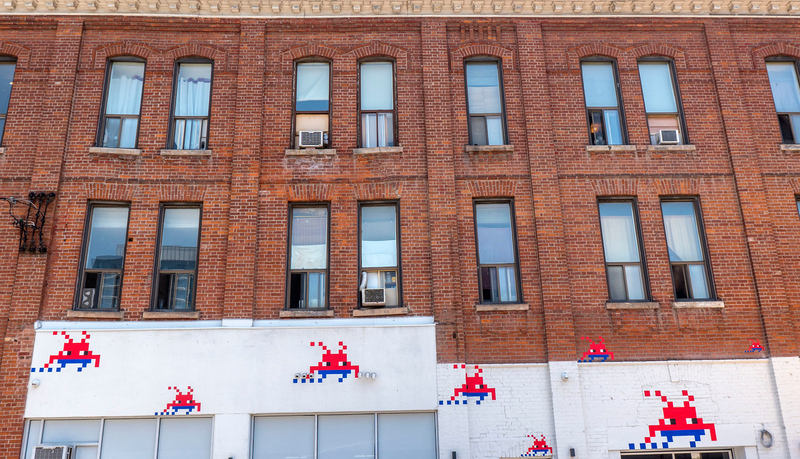 Many of these before you reach Ossington Avenue are painted walls and garage doors. 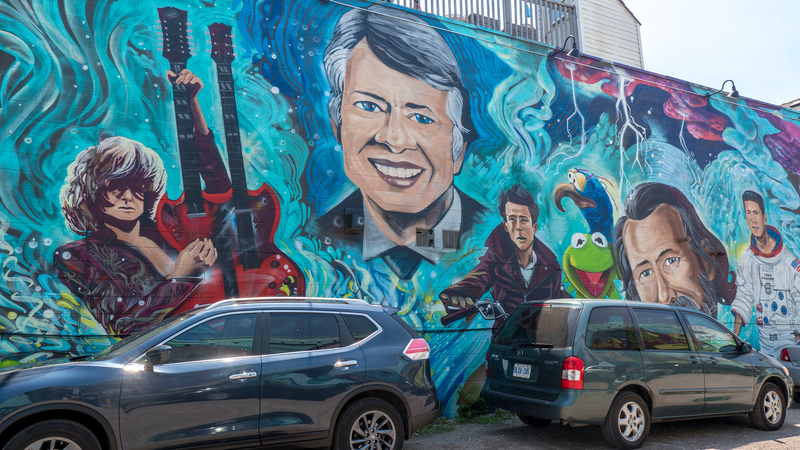 But, don’t miss the murals in a parking lot on Ossington Ave. These ones are the largest and most beautiful, in my opinion. 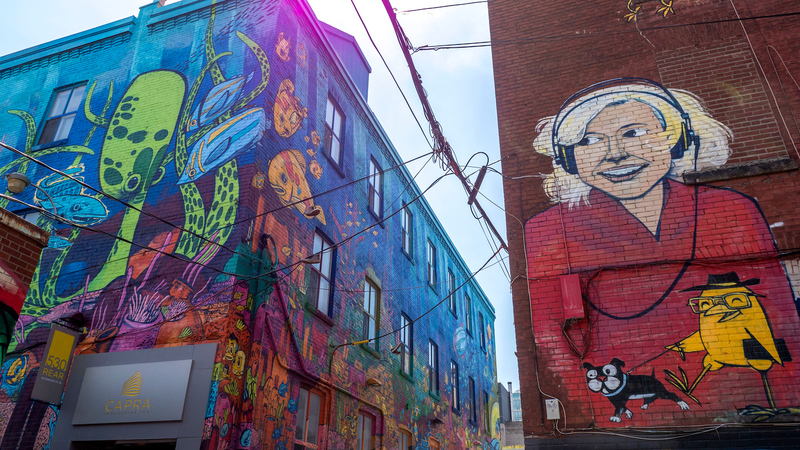 However, wander around the alleyways in this area between Queen St W and Humbert Street as you never know what Toronto street art you might find! 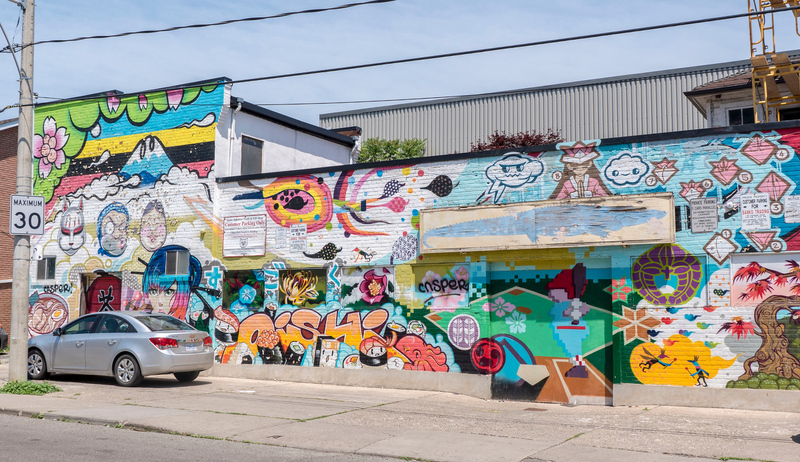 This next set of Toronto murals and street art are all on or just off Ossington Avenue. 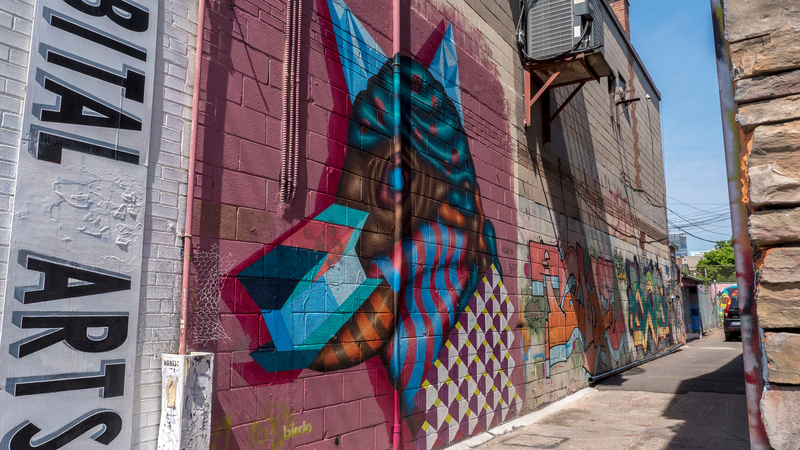 This alleyway is almost a continuation of Graffiti Alley, but less famous and the artwork is slightly less striking. 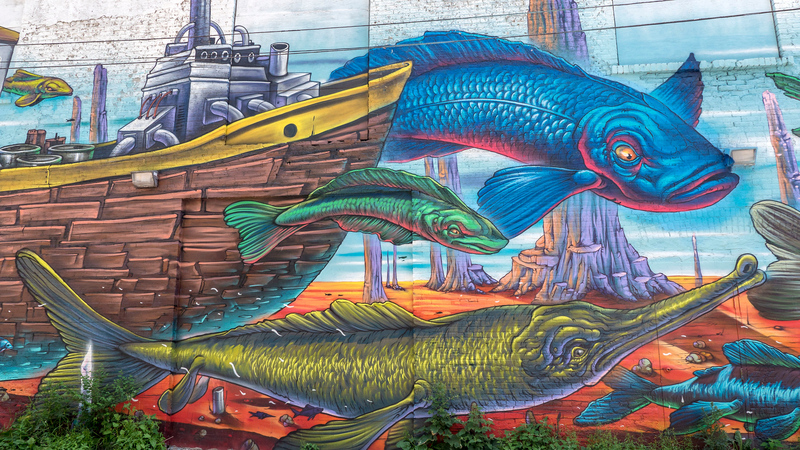 Even still, there’s a high concentration of murals and tags here, and it’s definitely worth checking out. 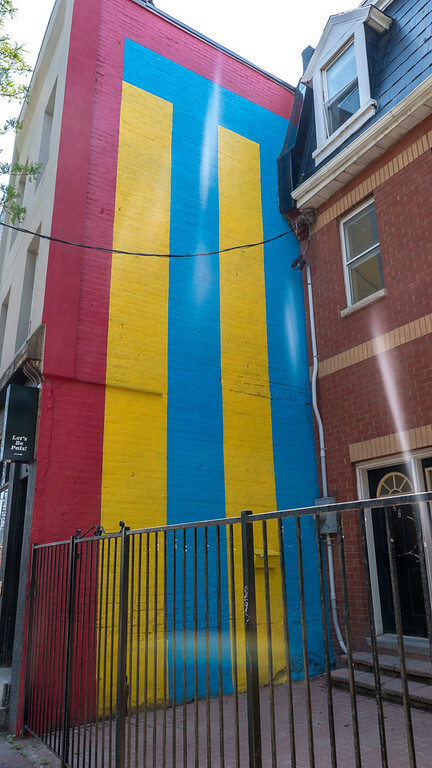 Start at Niagara Street and walk down the alley just one lane south of Queen Street West. Continue along this stretch until you reach Bathurst. At that point, swing one street south to Richmond Street until you hit Portland Avenue, where you’ll walk north to reach Rush Lane (aka Graffiti Alley). 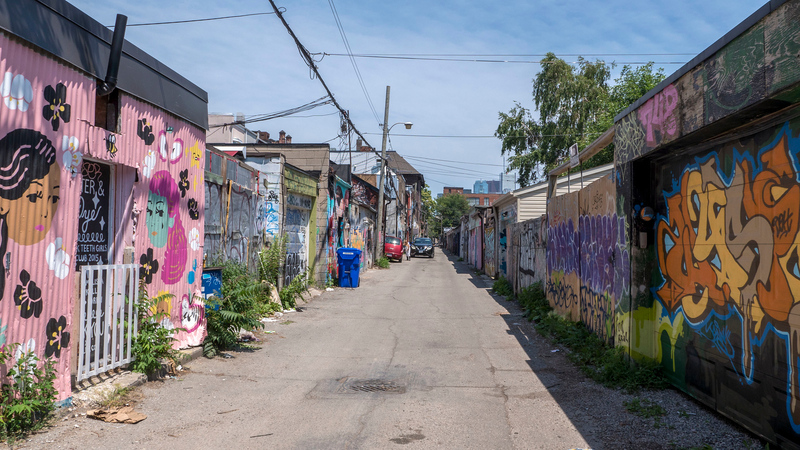 Please note that between Bathurst Street and Portland Street, this alley continues as “Public Lane”. I don’t recommend walking down Public Lane as it’s quite dirty and there’s no art there. 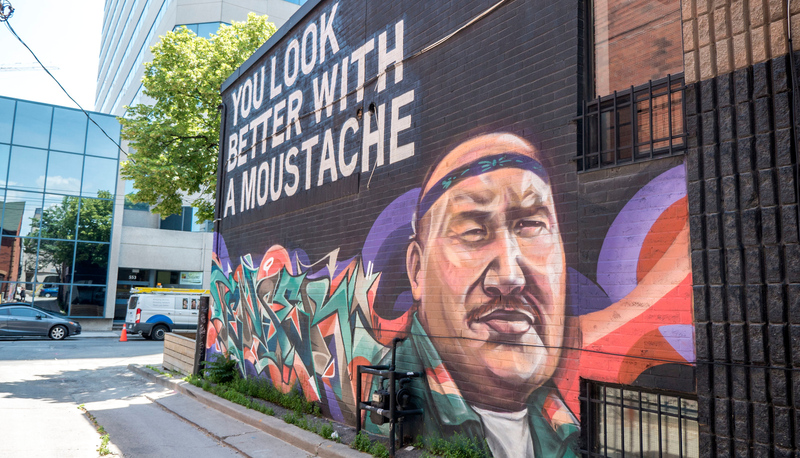 However, on the corner of Public Lane and Richmond Street, there’s the striking mural that reads, “You look better with a moustache” that you should visit. 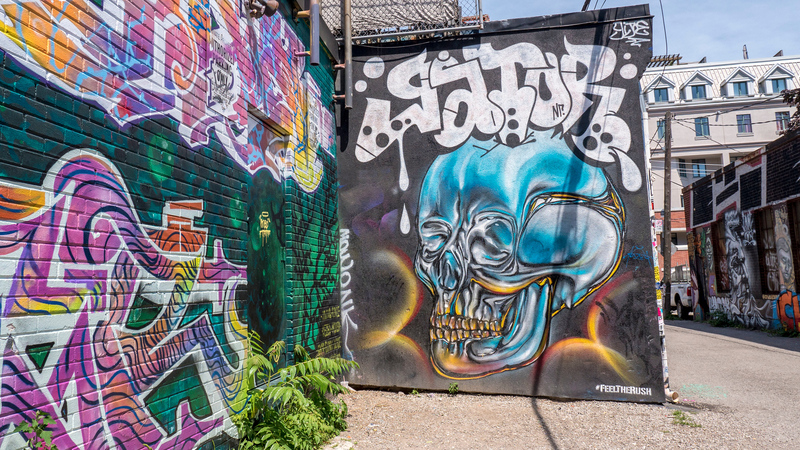 Graffiti Alley (on Rush Lane) is arguably home to the best Toronto street art. 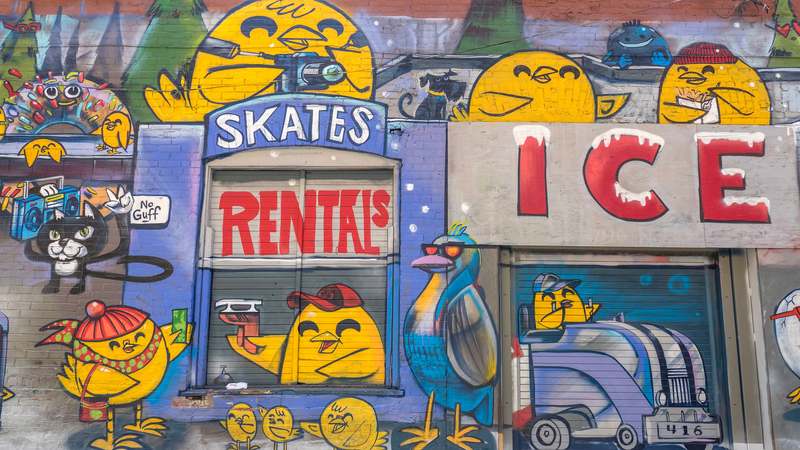 It extends from Spadina to Portland, one street south of Queen St. W. You’ll find a huge collection of graffiti, street art, and murals here. 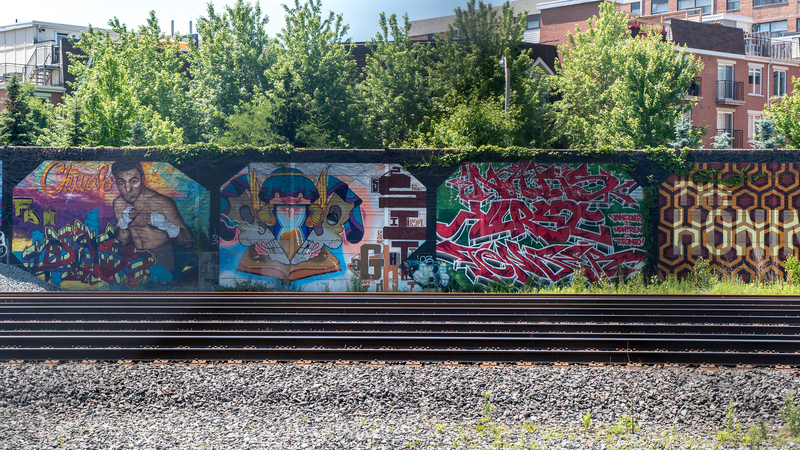 If you’re looking for graffiti in Toronto, it’s definitely the best place to start. 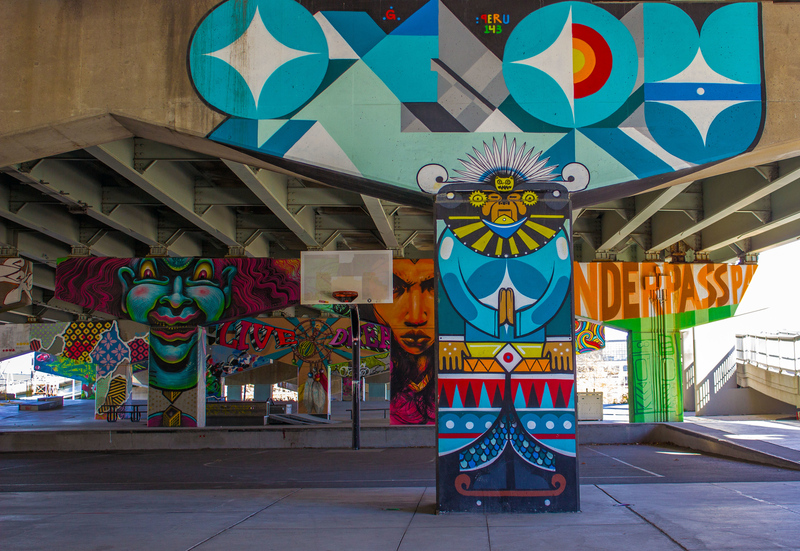 You’ll be able to see works by renowned artists, including Uber5000, Elicser, Poser, Skam, Spud, and many others. 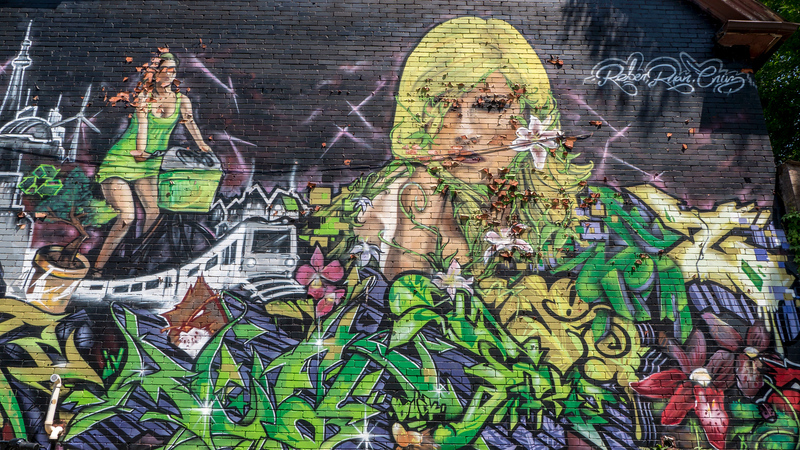 One of the wonderful things about Graffiti Alley is that it’s constantly changing. 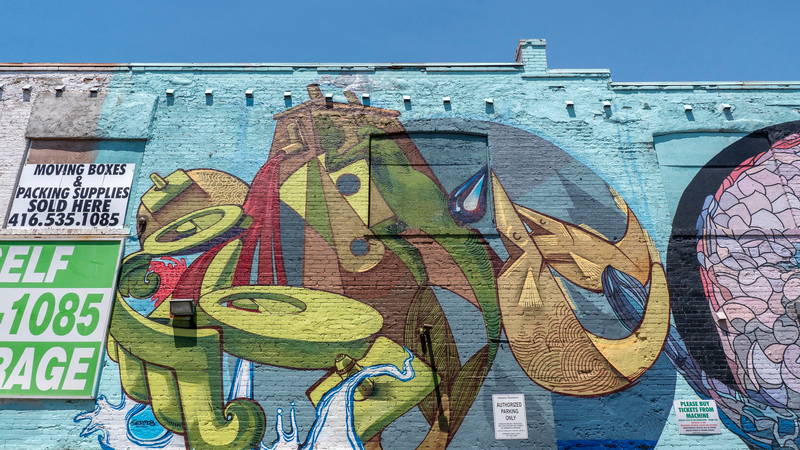 One mural or piece that might exist one year could be gone the next. 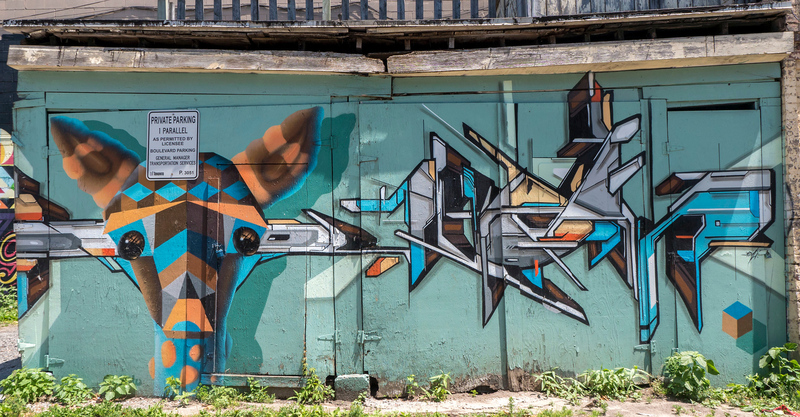 Artists are constantly painting over their old works with new creations. 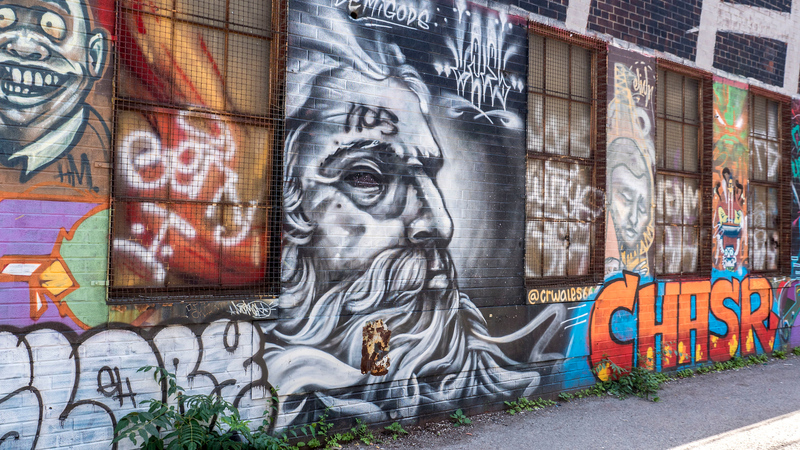 Graffiti Alley is likely one of the most Instagrammable places in Toronto, so get out your camera or Smartphone and start snapping pics! 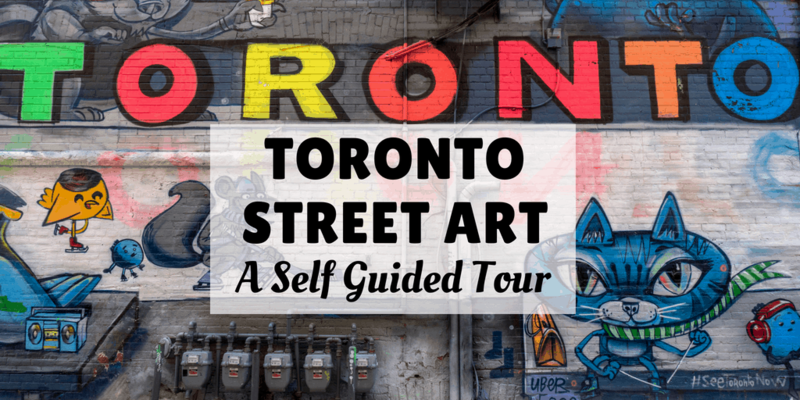 Pro Tip: If you’re interested in a guided tour with the experts, check out the free Toronto street art and graffiti tour operated by Tour Guys. It’s daily during the summer months and it’s a free walking tour. Visit their website for more details. 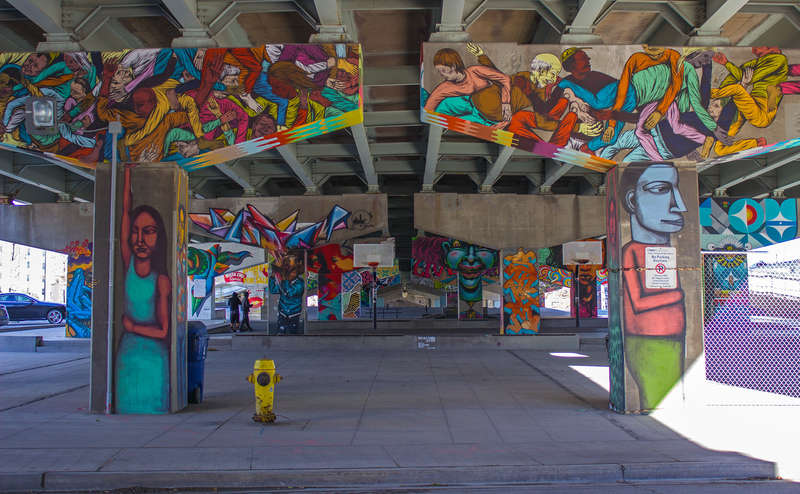 I was fortunate enough to see Toronto street art in the making! 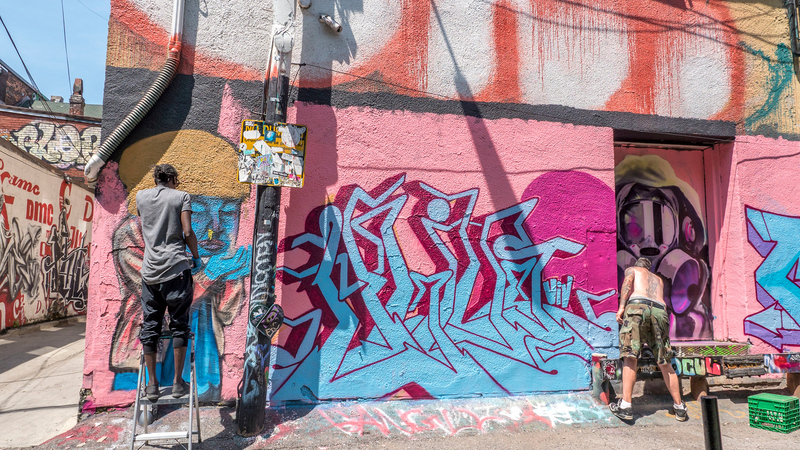 There were two artists painting a wall as I walked through Graffiti Alley. 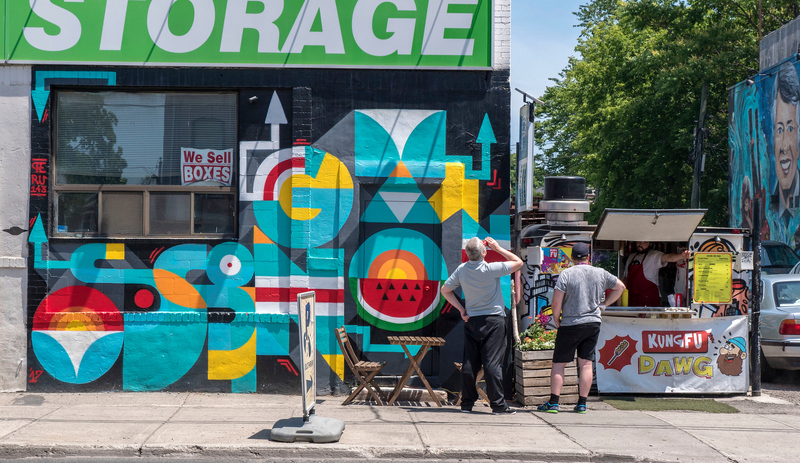 Kensington Market is likely Toronto’s most famous neighbourhood. 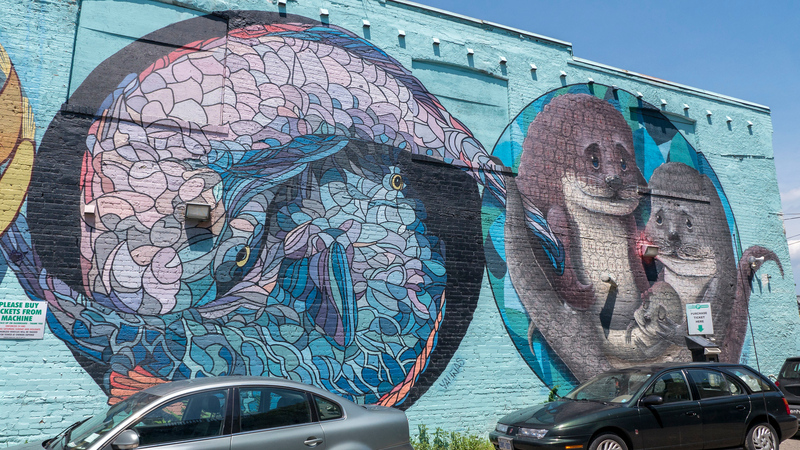 It’s home to many eclectic and independently owned shops, cafes, and plenty of street art. 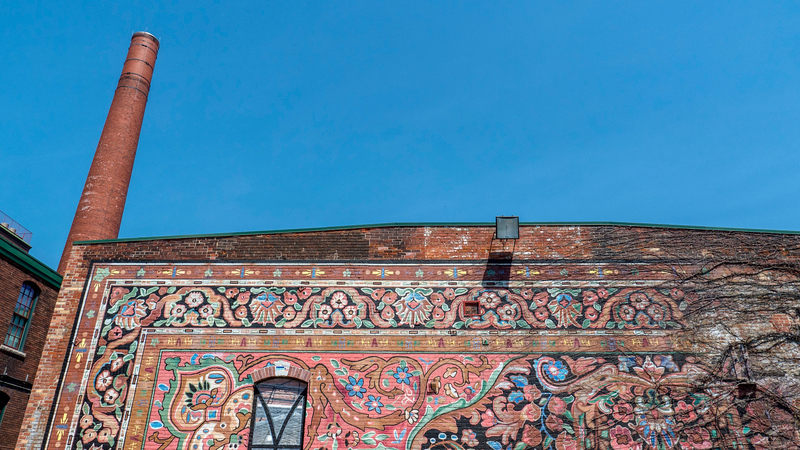 If you wander around the streets, you’ll see vintage and used clothing stores, food stalls, and lots of brightly painted buildings and walls. 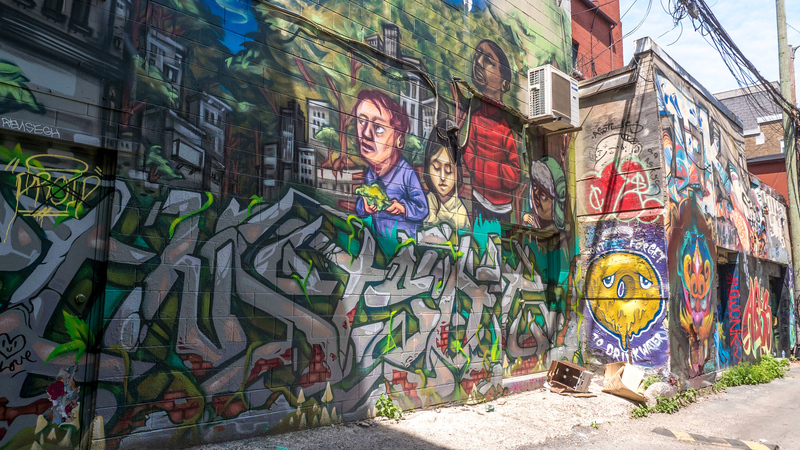 It’s easy to see why an area like Kensington Market lends well to street art in Toronto. 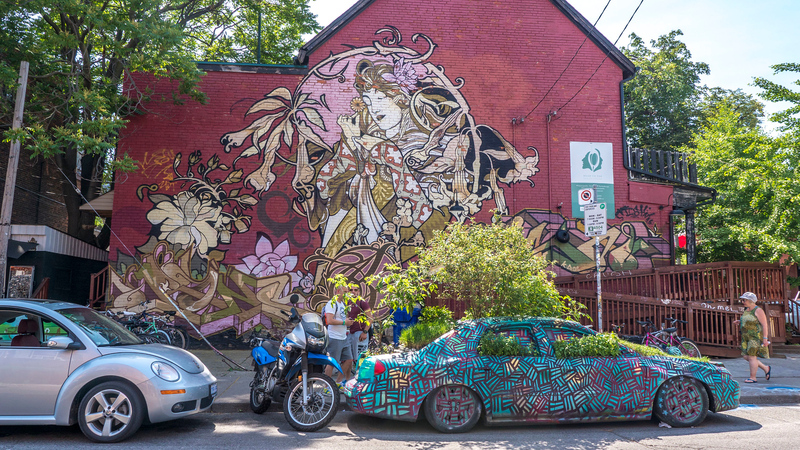 The most famous painted piece in Kensington Market is the parked car with greenery growing out of it, which also happens to be in front of a huge mural. The car gets a fresh coat of paint from time to time, so it might look different the next time you visit. 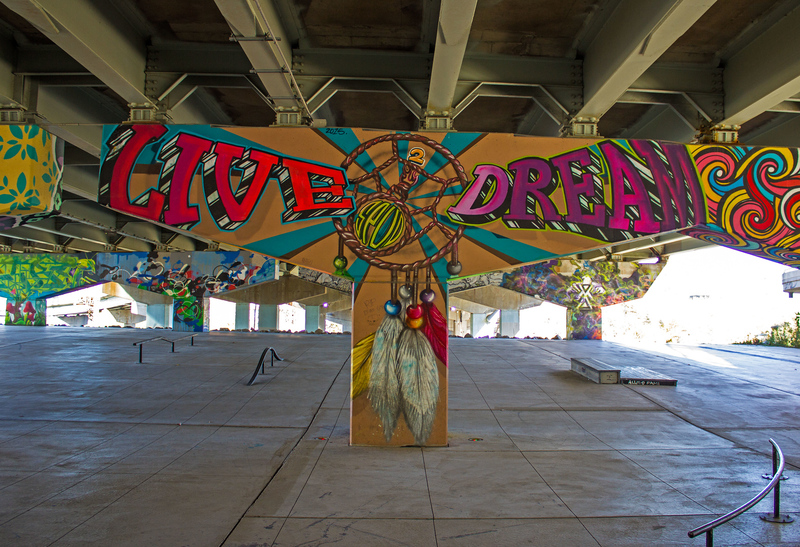 Underpass Park is a creative use of urban space beneath a highway overpass. By transforming an unused, run-down area into a park, the neighborhood residents gain an attractive spot to hang out with friends and family. 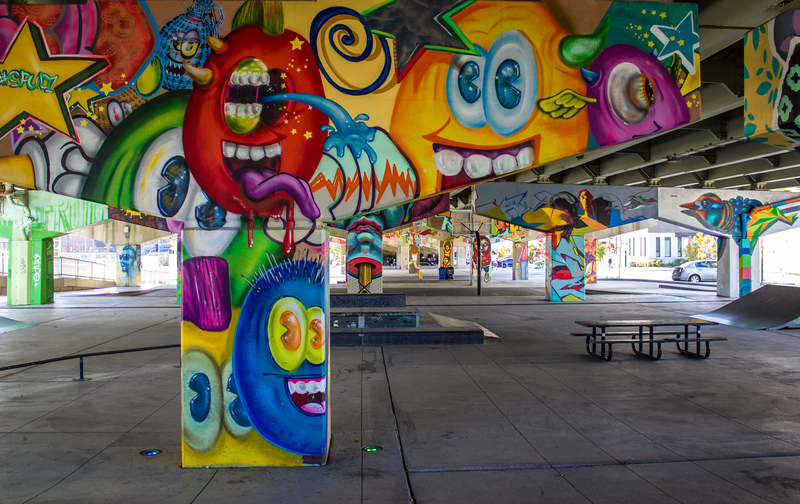 It’s home to a playground, a skate park, basketball court, and an outdoor public art gallery. 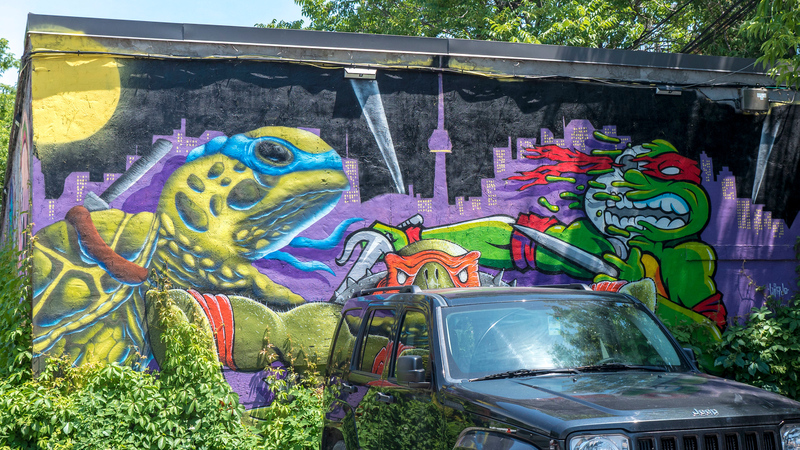 It’s one of the most unexpected, unique places to discover Toronto street art. 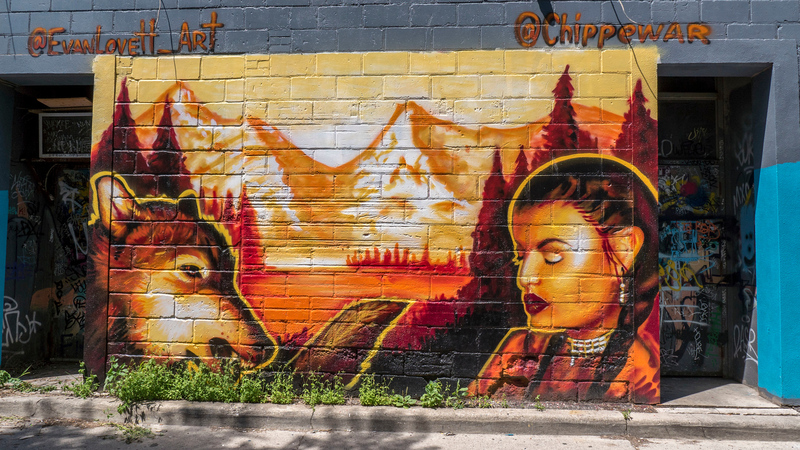 Want to see even more photos of Toronto street art, graffiti, murals and tags? 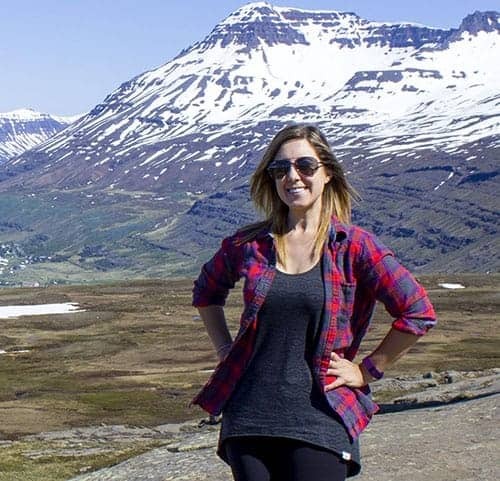 Check out my travel photo gallery. Click here to purchase prints, canvas photos, housewares, and more made from my photography at my Smugmug site. Looking for more things to do in Toronto? 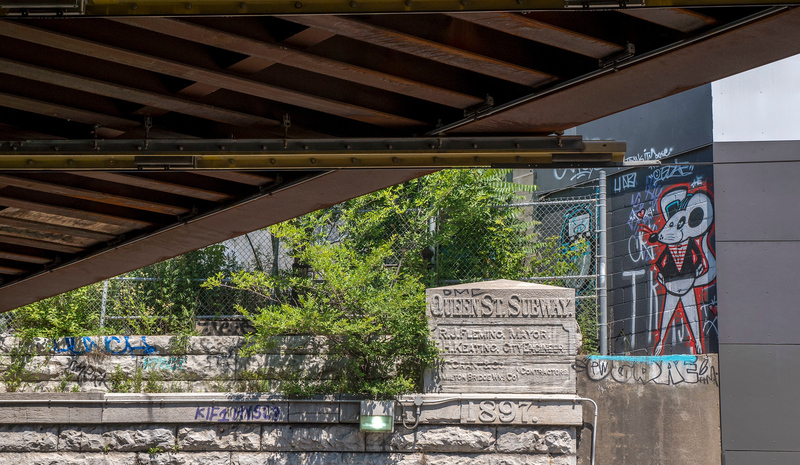 Check out my ultimate list of 150 things to do in Toronto. 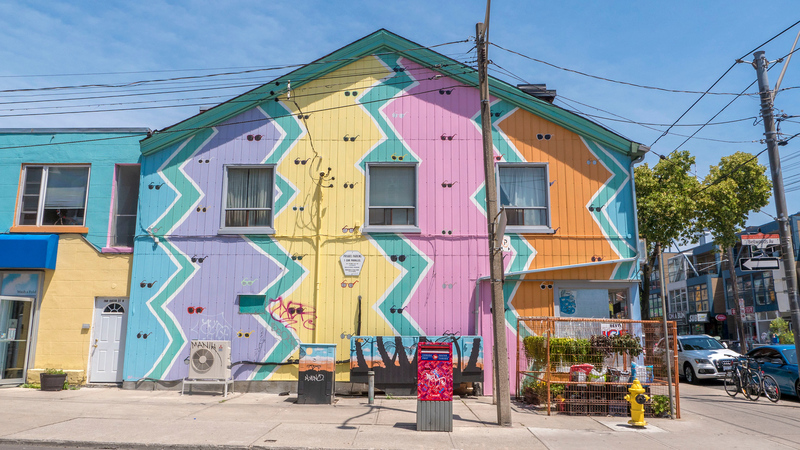 Here’s also a compilation of the best places to visit in Toronto, as recommended by fellow travel bloggers. 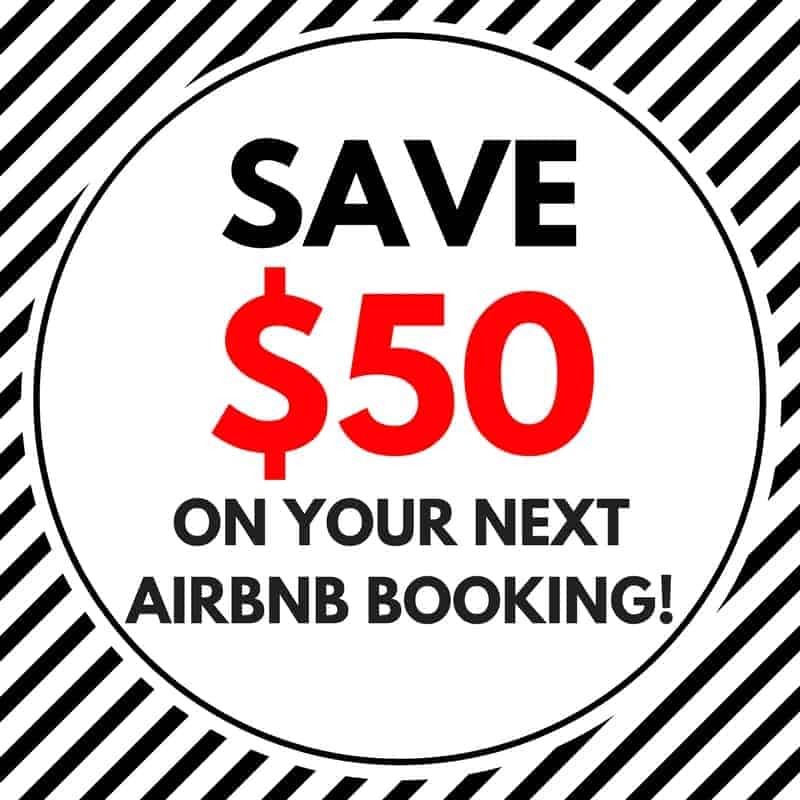 Compare the prices of several hotels in Toronto. I recommend staying anywhere that’s centrally located or near a subway line so you can make the most of your time in the city. 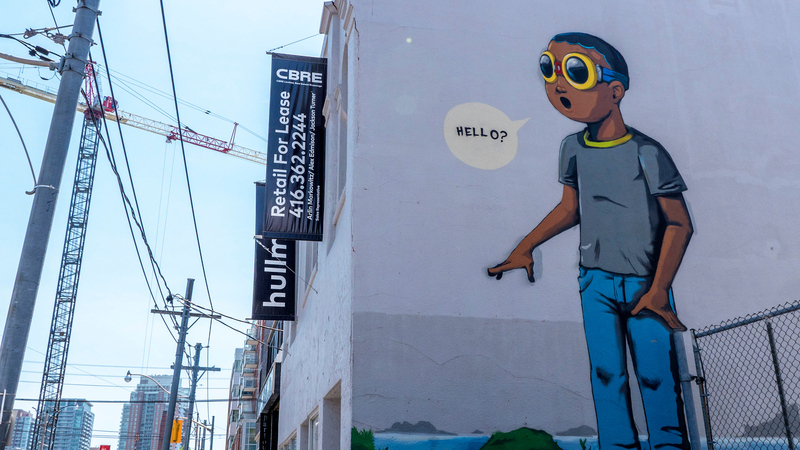 This is by no means a complete guide of Toronto street art, but it’s a start! 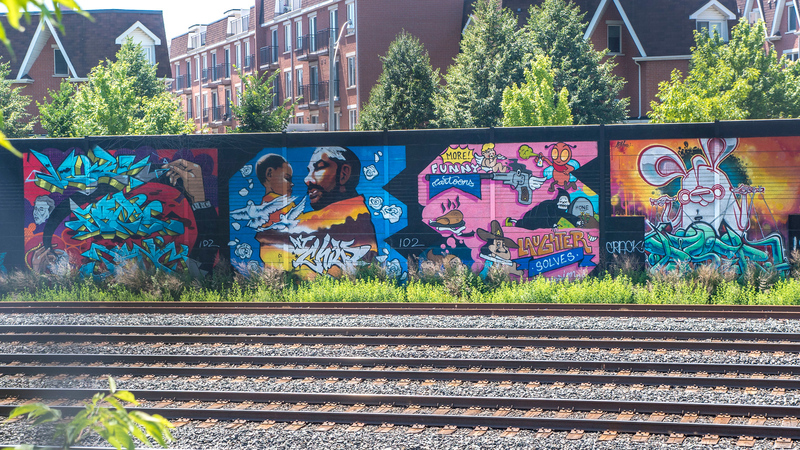 I’ll be adding more to this blog post and map as I see more murals and graffiti in person for myself. 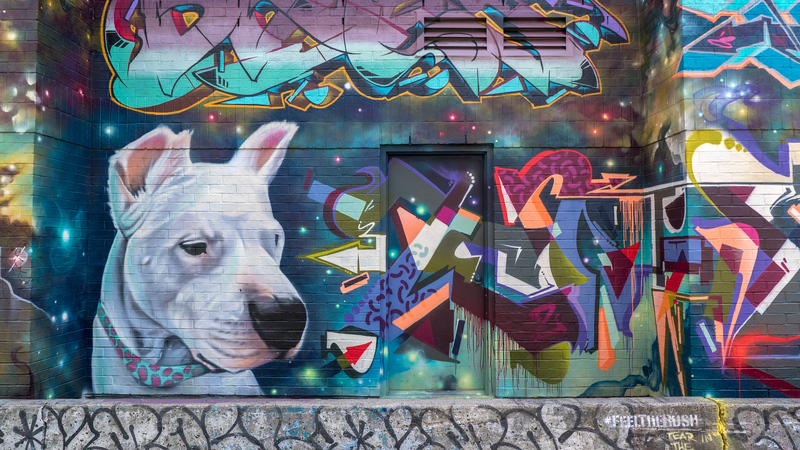 Have you checked out the street art in Toronto?